This stony coral is commonly seen in shallow dives. 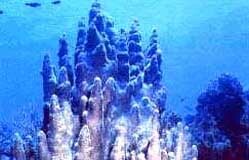 Its size vary from 3 to 8 feet and polyps are normally extended during the day. Locally called "Walt Disney Castle".